I was showing all the travel related articles that I wrote to a friend of mine. Even before she completed reading one article that dealt with offbeat staying options in Seychelles, she asked me if I know of my any tree houses near Mumbai as she is planning a second honeymoon next week. She could not believe people stay up on a tree house in a forest. She said she never heard of tree lodges. I promised her I will find out if there are any tree houses near Mumbai. Well, I completed the research and compiled a list of tree lodges near Mumbai. Some of the tree sheds are really close to Mumbai, others are located as far as away near Nagpur, a big city in the state of Maharashtra, India. 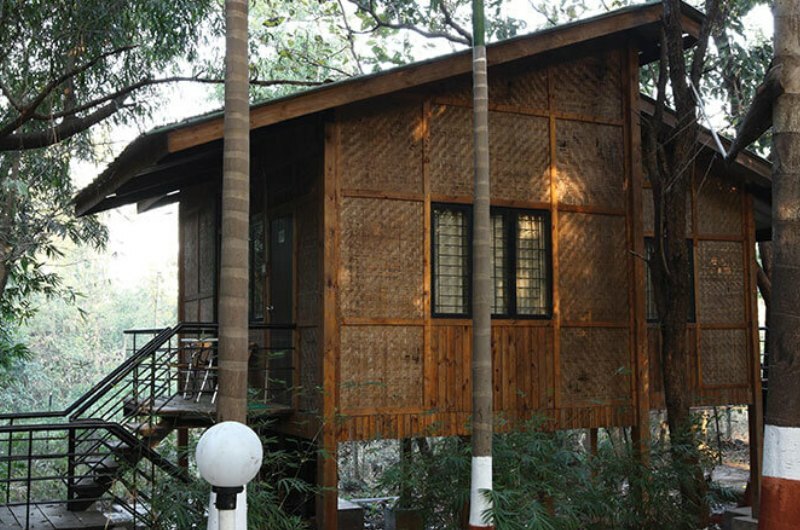 However, all the tree house resorts are located in Maharashtra. 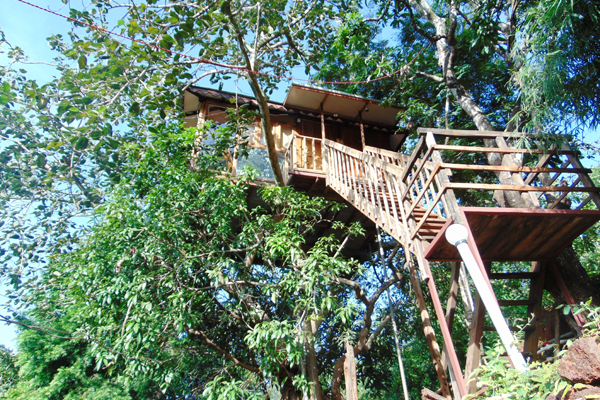 Here are some of the tree houses near Mumbai that you can book for your second honeymoon. 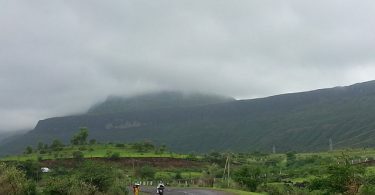 Mulshi valley is located 165 km from Mumbai city and 44 km only from Pune, Maharashtra’s second biggest city. 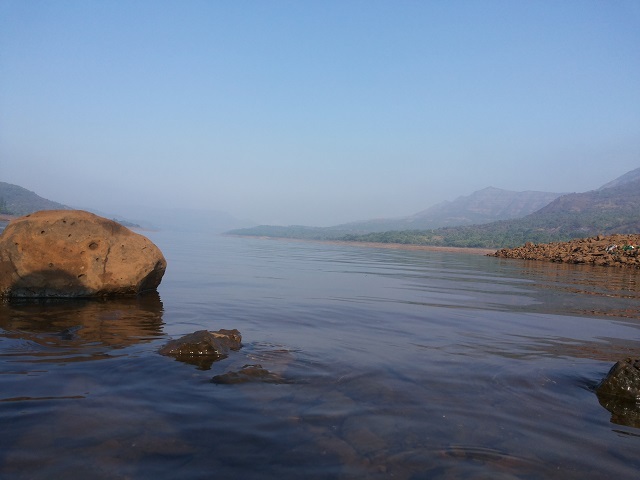 As you can see, Mulshi is very beautiful surrounded by lake, mountains, and jungles. 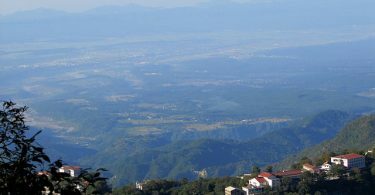 It is a less visited weekend gateway near Mumbai. This tree houses cottage is not located at a scary height but still comfortably placed and surrounded by dwarf mango trees and tall casuarinas. 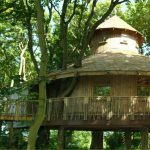 The tree house is rather spacious and comes with air-conditioning and television. 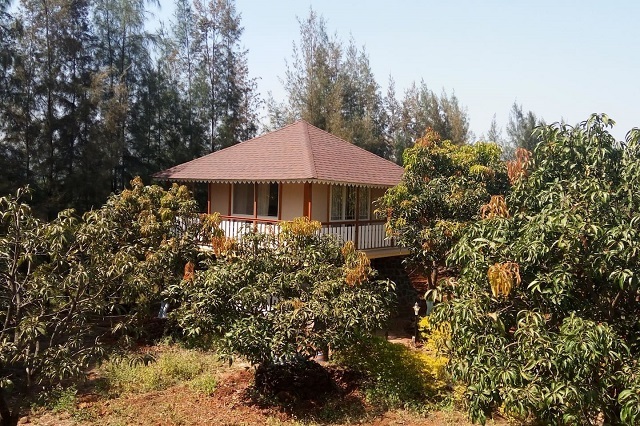 Since the Mulshi tree lodge is listed under Airbnb properties, it must be owned by a single person in whose farm the tree bungalow is located. Tamhini ghat section where there is a small waterfall too. This tree houses resort is located in Maharashtra’s Ratnagiri district. The distance from Mumbai is 240 km. In my opinion, that cannot be said as near to Mumbai. Nevertheless, the tree huts at Amrutes’ Nisarga Sahavas can be reached in about 3 hours given the excellent condition of road between Mumbai and Pune. The rustic tree hut is perched 25 feet above the ground on a tree. You will enjoy the basic furniture such as cots and chairs. 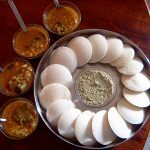 * Breakfast and dinner served on a buffet table. Similar to the tree lodge at Mulshi, the Nisarga tree huts are also located in an organic farm that produces several Indian fruits that include Mango, Chikkoo, and Guava. 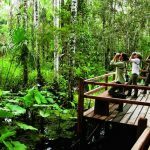 The promoters of the Nisarga tree lodges proudly call it as, “Agro-Tourism”. A commendable effort! 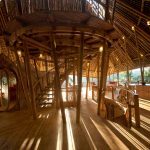 There are other types of tree houses at the Nisarga Sahavas with different pricing and are called the log house and the bamboo house. 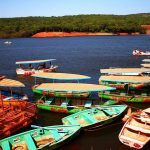 If you feel like getting away from all the farm-related activities, you can hit the coast and laze around the Murud beach. Dolphins are also sighed at this spot. The seafront is only 16 km from the tree house. Tree Houses Near Mumbai: Sajan Nature Club, Sajan Village, Palghar District. The treetop house is part of the Sajan Nature club that is situated in a 35-acre estate. 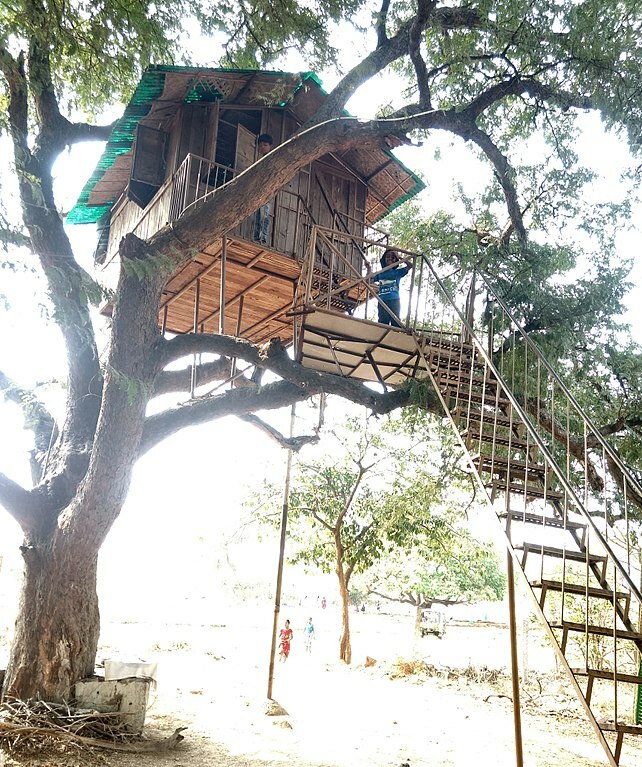 This tree house near Mumbai comes with air-conditioning. The Sajan nature club is only 125 km from Mumbai that can be covered in less than 2 hours by car. 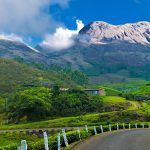 Your first destination should be Majiwada that is 25 km from Mumbai. From Majiwada, the Sajan village is about 99 km. This is the nearest tree house site near Mumbai. It’s only 83 km from Mumbai. Obviously, these different machans come with different facilities and amenities. Oh yes, the view of the surrounding Aamby Valley might also differ. The tree houses are situated about 45 feet from the earth. 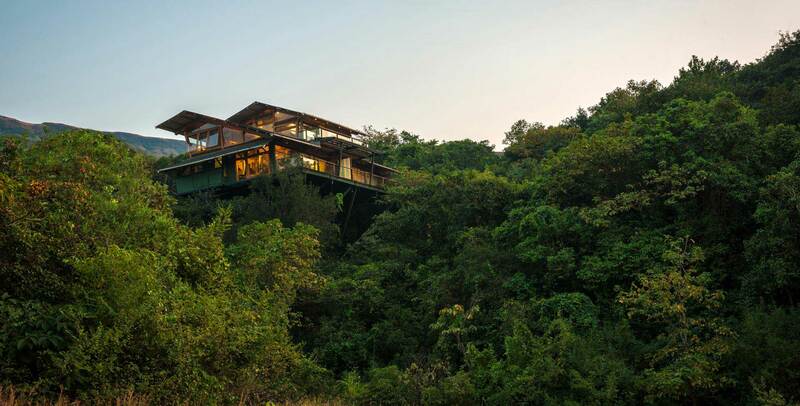 There are a couple of more tree houses in Maharashtra but they are too far away from Mumbai.